Welcome to Yarrambat Plenty Preschool! Established in 1976, Yarrambat Plenty Preschool has a long history of educating and caring for the children of Yarrambat and surrounding areas. 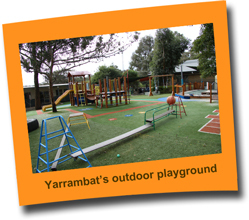 Yarrambat Plenty Preschool is a non-profit community based Preschool located on Ironbark Road. The Preschool is managed by a parent based volunteer committee and is supported by qualified, caring and dedicated staff. Know that all of these names do in fact refer to Yarrambat Plenty Preschool! We aim to provide the best start to their learning through a safe, nurturing and encouraging environment that will enhance and challenge each child’s own potential development; physically, emotionally, socially and intellectually in preparation for their future years. Areas are set up throughout the kindergarten to enable children to participate in various activities including puzzles for problem solving, drawing, painting and pasting for creative time and different topics throughout the year to stimulate young minds. We have a wonderful outdoor area where children can climb, swing, dig, run, slide and play various games with each other. The staff encourage the children to participate in a wide range of activities to inspire all areas of development and learning. Parent and carer involvement is essential to providing a quality learning experience for your child and we welcome your participation. Helping out with kinder duty is a fabulous way of finding out about the current topics your child is learning about. The children always love the idea of Mum, Dad or someone special coming to kinder with them. Yarrambat Plenty Preschool will help make the start of your child’s learning journey a positive and happy one.